I’m convinced that there are always a myriad of reasons behind a job change, but the primary reason is simply the most interesting. I’ve been beating this drum for some time, but it warrants repeating – you must provide a general career path to all new hires today. Many times in sales the thought process is to simply hire a strong salesperson and let them develop their own success. Their monetary success will be enough to keep them satisfied for years to come. For some, yes. For many more, no. The younger generation is looking for growth in their own skills and their career development. This desire for growth is present in most people, the difference with the Millennials is that they will simply leave a job after a short tenure to find a new opportunity. They are not “constrained” by the…traditional mindset of staying at a company for 5 years even if it gets to be repetitive. I think this is one of the most fundamental changes I have seen in the marketplace over the past 15 years. Does Job Jumping Matter Anymore? I would answer no. I have the opportunity to look at many resumes on any given day and there is a definite sea-change in the job jumping area. Millennials are far less loyal to their employers than any generation before them. In fact, I would say “job” jumping isn’t accurate, they are actually “skill” jumping. These employees are often looking for personal skill development and once they sense they have tapped out their growth curve in their current role, they leave. I spend a fair amount of time explaining this skill jumping behavior to old-school hiring managers. Companies must have a plan for ongoing development of their Millennial workforce otherwise they will look for skill development at a different company. Sullivan says that employers have become more accepting of brief periods of employment. As many as 32% of employers expect job-jumping. “It’s become part of life,” says Sullivan. 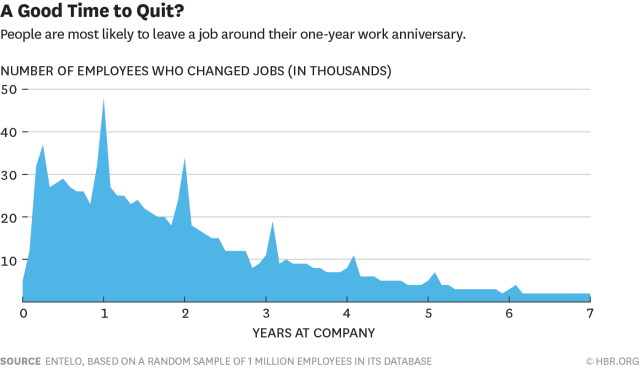 In fact, people are most likely to leave their jobs after their first, second, or third work anniversaries. Millennials are especially prone to short stays at jobs. Sullivan’s research shows that 70% quit their jobs within two years. So the advice to stick it out at a job for the sake of your resume is just no longer valid. Did you catch that…2 years! I suspect that fact is due to companies being slow to provide development paths for these new employees. The days of pension-earning careers with one company are long gone. The average length of time a worker stays in a job these days is 4.6 years. Have a plan to grow your direct reports’ individual skill sets. Put milestones out there for them to achieve. Have a plan and share it with them. If you need help, we can help. I have come across this fact with many of my customers and it always surprises me that they are taken aback by candidates who want to negotiate. One thing that business development salespeople do is negotiate. They live for the hunt which includes qualifying a deal and influencing the money structure to their benefit. Generally speaking, a good hunter knows he or she is good at what they do and they also know that companies are willing to pay for their skills. Thirty-seven percent of people always negotiate salary while 44 percent say they negotiate occasionally. Just more than 18 percent—nearly one-fifth—of people we surveyed never negotiate their salaries. Ever. Interesting isn’t it? 18% never negotiate salary while 37% do. It would be more interesting to know how many sales candidates negotiate salary. I personally enjoy a good negotiation with a candidate. This activity provides some insight into how they will handle a negotiation with a prospect. You will see both their strategic and tactical approach to money. Do not underestimate the value in this activity. Retention does not seem to be a topic of great concern in this present economy. However, the economy will turn and hiring will accelerate. When this happens (hopefully sooner rather than later), retention will become a key topic for many companies. Find incentives that work. The best Chipotle restaurant managers get the title “restaurateur” and a $10,000 bonus for each person they hire who starts as crew and goes on to become a manager. We have 170 restaurateurs out of 1,000 managers, and the turnover rate among them is very low. Two things that work in this incentive plan are the status and recognition reward (“restaurateur”) and the material possession reward ($10,000). I suspect their turnover rate is quite low based on these two incentives. I made that up, Sinking Stock Syndrome, from some interactions I have had recently with a couple of small business owners. Both owners suffered from this syndrome which had disastrously negative effects on their company, both in revenue and morale. Here is how I define my newly-minted syndrome – an irrational hope that a grossly underperforming salesperson will miraculously turn things around and become a sales superstar. The problem stems from the business owner who has invested in this failing salesperson. Notice I used “business owners” – I do believe this syndrome is more prevalent among this group as they are closely tied to the business (i.e. financially, emotionally, historically). They usually have a relatively accurate count of the resources invested in this salesperson. The sinking stock analogy will be understandable to anyone who buys and sells stock. When you purchase a stock, you expect (hope) it increases in value. When it goes the other way, you encounter a sinking feeling as you have now lost money. It is at this point that you need to make cold, objective decisions about the stock. Is it going to rebound in an acceptable time frame or did you make a bad investment? The temptation is to hang on to the stock with the expectation it will turnaround and at least get back to the buy price you paid so you can break even. While you wait, the stock drops further and you have now lost more money. Hope keeps you from dumping the stock. The desire to earn back what you have lost keeps you from making the tough decision to sell. Business owners can get caught in this same trap. They know a salesperson is not performing and that they are losing money by continuing to keep them in the role. Other employees see that this salesperson is not closing deals and they start to become upset. This salesperson stays on the payroll even though it is clear that he/she cannot do the job. At some point, the tough decision has to be made. It can be to put together a get-well plan for the salesperson. However, most times it is to part ways…or should I say cut your losses? It is difficult, almost an admission of failure that hits the owner directly. But it has to be done. Minnesota’s unemployment rate dropped 0.2 percent in June to a seasonally adjusted 6.8 percent even though employers cut 3,700 jobs during the month, the Minnesota Department of Employment and Economic Development (DEED) said on Thursday. Clearly workers had to leave the workforce or unemployment benefits expired for many Minnesotans. It is probably a combination of both factors. This is a critical flaw in the unemployment number. The better approach here would be to track how many people are actually working. It is interesting to note that in the United States more people quit their jobs in the last three months than those who lost their jobs. After 15 straight months of time in which layoffs exceeded voluntary departures, it appears that the job market is finally shifting. In a related development, one-quarter of our business community’s most promising employees are increasingly disengaged and many are actively seeking new employment opportunities. A recent study on employee engagement, conducted by the Corporate Executive Board’s Corporate Leadership Council (CLC), found that 25 percent of the “employer-identified, high-potential employees” plan to leave their current companies within the next year. Compare that figure to the one from 2006 and we have seen an increase of 250 percent. Moreover, 21 percent of today’s employees identified themselves as “highly disengaged”. This group has increased nearly 300 percent since 2007. The mass movement of employees is on the horizon, but I think there will be limited movement until the economy rebounds. In spite of what the government says, the economic situation is still tenuous at best. According to a new CareerBuilder survey, more than one-quarter (28 percent) of sales employers are concerned about losing their high performing workers in the second quarter, while more than one-third (35 percent) of sales workers said it is likely they will start looking for a new job when the economy picks up. •Pay – More than one-third (35 percent) of sales workers said they are dissatisfied with their pay. •Work/life balance – One-in-five (20 percent) sales workers said they are dissatisfied with their work/life balance. •Career progress – One-in-five (21 percent) of sales workers said they are dissatisfied with the career advancement opportunities provided by their current employers. I’m a bit jaded here in that I think pay is probably much higher then what is normally reported in these surveys. Nonetheless, I have talked to a handful of salespeople recently who are starting to put their ears to the tracks regarding new opportunities. I still believe the hiring landscape will be slow this year, but will begin to ramp up in Q4. A year from now may be one of the largest retention struggles we have seen in quite some time.